Alpha - ZineWiki - the history and culture of zines, independent media and the small press. Alpha was a science fiction fanzine by Jan Jansen and Dave Vendelmans. Alpha was published in Belgium in the 1950s. It was the official organ of the Antwerp Science Fiction Fan Club. The first issue appeared in Summer 1953. Jaap Boekestein, in his article "Dutch and Flemish fandom, fifties and sixties", writes, "The real first recognisable fandom and fanzine was the Flemish Alpha." 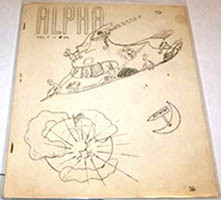 Jan Jansen and Dave Vendelmans were in contact with fans in Britain, and some fans were stationed with the British army in Belgium, so Alpha began as a dual language fanzine, featuring both Dutch and English, and was probably the first science fiction fanzine to be published in Europe, outside of the UK. Aside from Belgium fans, it had readers in the Netherlands, the UK, and the U.S.A. It ended up being printed entirely in English. Contributors included Eric Bentcliffe, Vernon McCain (Wastebasket), Marie-Louise Share (Caprice, Cameo, Hodge-Podge), and Bob Shaw, among others. Walt Willis, in his Nebula column "Fanormama", reviewed Alpha #7, saying, "This is the first manifestation outside the English-speaking world of the peculiar form of self-expression known as the fan magazine. The editors are two young Belgians who, fortunately, write better English than most of us. Dave Vendelmans emigrated to Canada in 1956 and Alpha ceased publication at that time. About 23 issues were published in total between 1953 and 1956. Dave Vendelmans also co-published the apazine Through Darkest Belgium with Ron Bennett for the Offtrails Magazine Publishers Association. Jan Jansen also co-published the apazine Antwerpse Letterkundige En Wettenschappelijke Gazet with Ron Bennett (Ploy, Skyrack) and Archie Mercer (Vector) for the Offtrails Magazine Publishers Association, as well as the international newszine Contact, with Ron Bennett, John Hitchcock (Umbra), and Ellis Mills. This page was last modified on 29 December 2017, at 16:01.